One month to go. We can see the light at the end of the tunnel. In today's preview, we examine the Pac-12, a league that hopes to celebrate the return of one of their traditional powers off probation. 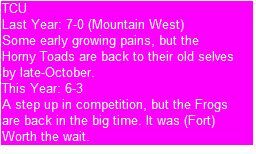 To see last year's Pac-12 preview, click here. Yes, believe it or not, the Trojans from Southern California have not won a Pac-10/12 championship since 2008. In their stead, the Oregon Ducks have captured three straight league championships while posting a 25-2 conference record over that span. Having an inquisitive mind, I wanted to see how this compared to the most dominant three-year stretch Southern Cal enjoyed last decade. While the Trojans won outright or tied for seven straight Pac-10 titles beginning in 2002, their most dominant three-year stretch was from 2003-2005. During that span, the Trojans went 23-1 in league play, won a shared national title, won an outright national title (later vacated), and played for another national title. While Oregon has won three consecutive Pac-10/12 titles, they have not won a national title, and are just 1-2 in their BCS appearances. On the surface the Trojans appear to be the more dominant team. Before we crown them though, let's look inside the numbers. To calculate how dominant each team was, I looked at how they fared against their conference competition. The results are summarized in the following table. As you can see, Oregon matches and exceeds Southern Cal in terms of offensive production, averaging an incredible 43.6 points per game against their Pac-10/12 mates. 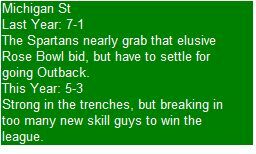 However, the Trojans are untouchable on the defensive side of the ball. While the Ducks have allowed a solid 23 points per game, Southern Cal allowed just 17.8 during their incredible three-year run. Not to take anything away from Oregon, but the Trojans in the middle part of the last decade were a cut above. The countdown has reached five weeks. Just 35 short days until the kickoff of the 2012 season. To tide you over, we present a preview of the Big 12, a league that adds two new members, TCU and West Virginia. 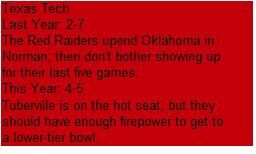 To see last year's post on the Big 12, click here. Kansas State enjoyed a great deal of unexpected success in 2011. The Wildcats won 10 games for the first time since 2003, climbed into the AP top-10, and finished the season ranked number 15. A huge reason for their success was quarterback Collin Klein. Klein threw for less than 2000 yards on the season and only managed 13 touchdown passes. However, he accumulated an amazing 317 carries from the quarterback position (75 more than the second ranked quarterback Tevin Washington of Georgia Tech). Perhaps not surprisingly, with the ball in his hands for so many runs, he scored a lot of touchdowns. His 27 rushing touchdowns ranked second nationally behind Montee Ball of Wisconsin (tied with Bernard Pierce of Temple). Of his 40 total touchdowns, Klein scored 31 in conference play. As a team, the Wildcats scored 37 times in Big 12 play, meaning Klein accounted for nearly 84% of his team's conference touchdown total. That was tops amongst all players from BCS conferences in 2011. For those scoring at home, here is the top-nine from last season. 39 days until kickoff. That's right, in less time than it takes to celebrate the Lenteel season, football will be back. 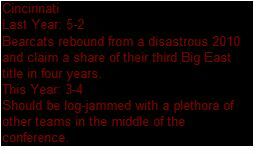 Today we examined the 2012 Big 10 season. To see last year's Big 10 post, click here. Illinois began the 2011 season looking like a Big 10 title contender. They defeated all four of their non-conference foes, including bowl squads Arkansas State, Arizona State, and Western Michigan, then opened Big 10 play with a pair of wins over Northwestern and Indiana. On the morning of Sunday October 9th, the Illini were 6-0 and ranked 16th in the AP Poll, their highest ranking since rising to 13th during their Rose Bowl season of 2007. The Illini would not win another game until the final day of 2011, when they upended UCLA in the Fight Hunger Bowl. 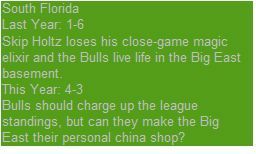 Along the way, they would lose six straight and finally rid themselves of the coach known as Ron Zook. 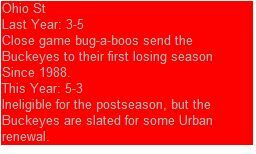 What happened to Illinois over the final half of the season? To answer that question, I looked at how Illinois performed in their first two conference games (wins over Northwestern and Indiana) versus how they performed in their final six (all losses). If we're looking for scapegoats, we can forget the defense. Illinois allowed an average of 316 yards per game to Northwestern and Indiana. Not too shabby. However, over their final six league games, the Illini performed even better, permitting their foes to average just 287 yards per game! So where can we place the blame? In their first two games, the Illini averaged 496 yards per game. Over their final six games, that number was almost cut in half. The Illini managed just 269 yards per game during their six game skid. Was there any way to predict this massive cliff dive? The splits for the Illini in some other offensive categories are listed in the following table. The Illini averaged nearly seven fewer yards per pass attempt over their final six games, a spectacular decline, especially considering their completion percentage did not see a significant drop. They also averaged about a yard fewer per rush. The pair of numbers that may have portended their precipitous decline is the large sack and turnover totals Northwestern and Indiana racked up even in defeat. The Wildcats and Hoosiers combined to sack Illinois quarterbacks seven times. The Illini actually improved their protection, albeit marginally over their final six games, merely allowing three sacks per game. 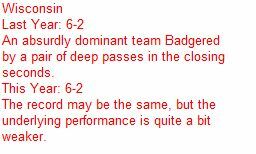 However, the lack of pass protection was clearly an issue even when they were moving the ball and winning. 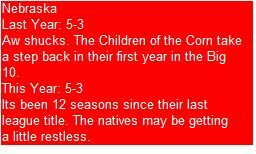 Illinois also committed five turnovers in their two wins. Their turnover rate was relatively unchanged (2.5 per game in the wins and 2.67 in the losses), but their proclivity for killing drives with mistakes was manifest even early in the season. While the schedule did toughen up in the second-half, with the Illini facing five bowl teams in their final six games, their offensive decline was likely a market correction of sorts. The Illini simply performed well above what could reasonably have been expected based on the weaknesses and mistakes evident in their offensive numbers from the first two games. A few days ago, here at Statistically Speaking, we previewed the ACC. Now we come to our second conference preview, the Big East. The conference maintains eight teams in 2012 with the loss of West Virginia to the Big 12 and the addition of Temple from the MAC. To see last year's Big East preview, click here. How Valuable are the Home Games? The Big East is unique in that it is the only BCS conference that plays seven league games. 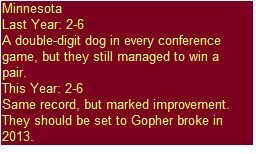 Of course, this is because there are only eight teams in the conference. In addition, the Big East, along with the Big 12 and Pac-12 (who play nine) are the only BCS conferences that play an odd number of conference games. Obviously, this means that half of the league's teams get to play four conference home games, while the other half are forced to play four conference road games. Intuitively, with a sample of size of only seven games, getting to play four of them at home would seem to confer a great advantage to those teams. However, as Yogi Berra once said: 'In theory there is no difference between theory and practice. In practice there is.' Does this bit of intuition pass the test? 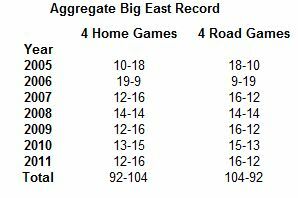 To answer that I looked at the conference record since 2005 of Big East teams that got to play four conference games at home and compared it to the conference record of Big East teams that had to play four conference road games. I chose 2005 as my starting point because that marked the first season Cincinnati, Louisville, and South Florida began play in the Big East. The table below summarizes the results. Surprisingly, the teams that had to play four league road games had a better record than the teams that got to play four league home games in five of the seven seasons. In only a single season did the teams with four league home games produce an aggregate record better than the teams with four league road games. Overall, teams with four league road games won conference games at a .531 clip while teams with four league home games won games at a .469 clip. So that's the aggregate. What about the individual? Was the Big East champion more likely to have four home games? No. Five of the seven champions (West Virginia 05, West Virginia 07, Cincinnati 09, Connecticut 10, and West Virginia 11) played four conference road games in the year they won the league, while just two (Louisville 06 and Cincinnati 08) played four home games. When forecasting Big East success, take heed of the quality of the team and don't overemphasize the value of one additional home game. Its that time of year again. We are T-minus 47 days until the beginning of the 2012 college football season. So its time to get started with the annual conference previews here at Statistically Speaking. We'll begin our conference preview with the ACC, a conference that has its best shot at producing a national championship contender since the early part of the last decade. 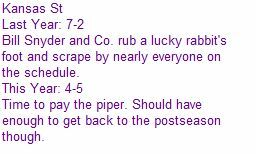 To relive last year's ACC preview (which accurately predicted Clemson to take the Atlantic Division), click here. Check back every three or four days as new previews are posted. Enjoy! Not much was expected of Clemson heading into the 2011 season. The Tigers were coming off their first losing season since 1998, breaking in a new starting quarterback, and installing a new offense. The offense of first year coordinator Chad Morris exploded onto the national scene and crushed all preseason expectations. Speeding up the pace and finding a freshman playmaker in receiver Sammy Watkins, the Tigers scored the most touchdowns and gained the most yards in ACC play one season after finishing 10th (of 12 teams) in both categories. The drastically improved offense helped the Tigers claim their first ACC crown since 1991 and saw them climb as high as number six in the AP Poll. To get an idea of how much faster the Tigers played in 2011, I looked at home many plays they ran per conference games in each of the past four seasons. The results are summarized in the following table. Clemson ran a little more than eight more plays per game in 2011 than they did in 2010 and about twelve more than they did in 2008. That may not seem like a huge difference, but running eight more plays is an increase of nearly 12% over the 2010 numbers and 19% over 2008. While digging through the Tigers' offensive numbers I noticed another change in addition to the increase in total number of plays. In 2011, the Tigers tilted their offensive styling to favor the pass. The table below lists Clemson's run/pass ratio in ACC play since 2008. A run/pass ratio of 1.00 means a team runs the ball just as often as it throws it. A ratio greater than one indicates the team runs more often. A ratio less than one indicates they throw more often. As you can see, Clemson was especially geared to the run in the two seasons preceding 2011, running roughly 25% more often than they passed in 2009 and 13% more often in 2010. Now this may be a function of personnel as Chad Morris had a stud freshman receiver in Sammy Watkins, perhaps making him more inclined to rely on the forward pass. 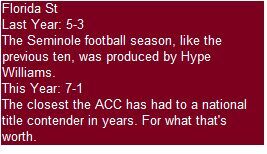 Similarly, the 2009 team had CJ Spiller at running back and an inexperienced quarterback in Kyle Parker under center so Billy Napier probably felt more comfortable handing the ball off. Still, the change in balance is quite large so perhaps Clemson fans should get used to the team chucking the ball more often.